Please join us for A Liturgy of Music and Prayer for Repentance in a Time of Crisis. 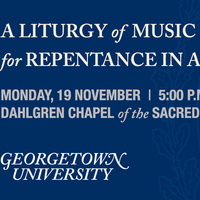 As part of a series of events hosted by the Office of Mission and Ministry and Campus Ministry in response to the clerical sexual abuse crisis in the Catholic Church, we invite the Georgetown community to join us in Dahlgren Chapel as we offer songs and prayers for repentance. Music will be performed by two Georgetown student ensembles - the Schola Cantorum and the Chamber Singers - and prayers will be offered by members of the Georgetown community.